Think pink go green! … it says on the box – very true in this case! The unit is a somewhat lurid pink making it hard to miss! (husband’s description) – there is a reason! * – wife’s response. 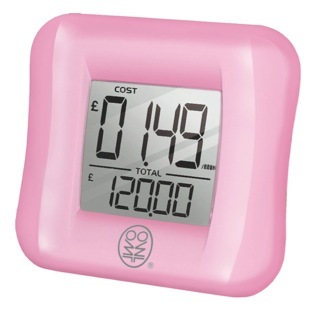 This OWL Pink Micro eco gadget is a special limited edition version of the best selling OWL Micro electricity monitor. A small investment of £25.99 will raise funds to help 46,000 women a year fight breast cancer* and save you £135** on your yearly bills. With the last of the ‘big six’ energy companies, EDF Energy, set to hike its energy prices this Spring, there is no better time to invest in an OWL Pink Micro. The unit comes with an easy to follow instruction leaflet, batteries are supplied. The display shows time, watts/ hour power, costs (after programming in the electricity cost charged by the supplier). We had a lot of fun with this. Be aware though that it is extremely unlikely the base line power usage will be zero (we have a base line of 120 watts); most homes have at least some power running somewhere eg central heating, fridges, alarm systems etc. Also it could be rather easy to get obsessed with switching off everything – we did to begin with! Just remember we all have to use some power in life; so a sense of proportion will help to keep the peace in the household! By the way it is unlikely the unit is sensitive enough to pick up low power units like individual light bulbs etc. However, if the unit succeeds in reducing power bills then it could be said to have saved costs – and to a small extent – the planet! WE HAVE THREE Pink OWL Micros TO GIVEAWAY! Just send an email to the editorinbalance@me.com with Pink OWL Micro in the subject box and your full contact details in the text area. Last day for entering the draw is 15 May 2011. One entry per household. To keep up to date with future giveaways click on the Subscribe button on the right. ← All Over the Place!